Four hundred and eighty-five years ago this month, the Renaissance painter Albrecht Dürer presented the town council of Nuremberg, Germany, with an extraordinary gift: a painting consisting of twin panels portraying four New Testament authors, accompanied by didactic verses drawn from the writings attributed to each. These biblical passages were taken from the first edition of Luther’s German New Testament, that runaway best seller published in 1522. The customary title of the painting, Four Apostles, is somewhat misleading, since only three of the four men depicted—Saints John, Peter, and Paul—were, strictly speaking, apostles. The fourth, St. Mark, though an evangelist, was traditionally thought to be a disciple of the Apostle Peter. Currently housed in the Alte Pinakothek museum in Munich, Dürer’s masterpiece represents one of his greatest achievements. The significance of Dürer’s donation to the Nuremberg magistrates (who had formally adopted the Reformation only a year and a half earlier) as well as the interpretation of the iconography and inscriptions have been the subject of much debate. What were Dürer’s intentions in presenting such an expensive and monumental work to the town councilors, rather than to the church? Was this a genuine gift or a sale — seeing as Dürer received payment of 100 gulden from the magistrates, who insisted that he be compensated? Christensen’s conclusion that “it is the primacy of the Word, above all, that is the message of Four Apostles” is clearly borne out in the visual components and their arrangement. 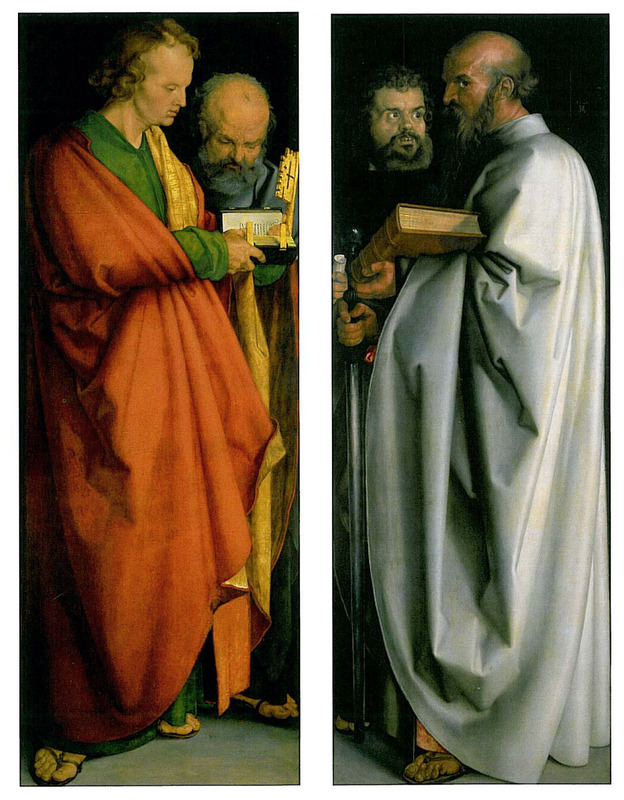 Three of the figures hold scripture: Paul holds a closed, entire Bible, while Mark holds a scroll of his Gospel, and John reads a book containing his Gospel — open to the first verse, which Dürer has included in Luther’s German rendering: “Am Anfang war das Wort” — in the beginning was the Word. But what, you may ask, is the Word of God, when there are so many words of God: the whole Bible, Old and New Testament? The Gospel accounts of Jesus? The Second Person of the Trinity who was “in the beginning”? It was this question that Martin Luther posed at the beginning of his 1520 treatise, Freedom of a Christian. His answer, spelled out in that treatise and other writings, such as the biblical prefaces he wrote for his German Bible, constitutes one of his most important but frankly most misunderstood legacies. Dürer’s painting captures visually what is truly distinctive about yet sometimes overlooked in Luther’s evangelical understanding of the Word and the nature of biblical authority. Scripture, as God’s word, is then a kind of performative speech (like the baptismal formula); most effectively, scriptural preaching is performative speech that puts forth Christ and creates faith. For Luther, the Bible is Word of God not just because of what it says but also because of what it does: it sets forth Christ in such away as to awaken faith in us. And those parts of scripture that do this pre-eminently are especially esteemed and function as the internal criterion for interpreting the rest of scripture. There is no iconographic tradition before Dürer for portraying these four biblical writers together, but in light of Luther’s views on the primacy of the gospel and where it is especially to be found, the logic of the figures as well as their arrangement is easily grasped. John on the left and Paul on the right dominate the composition, larger and lighter than Peter and Mark in the background. Their robes partially obscure the other figures, even as the books they hold mediate access to them. Peter was not only the presumed author of the epistle prized by Luther along with the writings of Paul and John; he was also the apostle to whom the keys of the church had been given and the predecessor of the Pope. He is here subordinated to John and reads in John’s Gospel for guidance. Of the other three evangelists, Mark is the one whose Gospel begins with direct mention of the gospel message: “The beginning of the good news of Jesus Christ, the Son of God” (Mark 1:1). Yet he, too, author of a great many of the deeds of Christ, needs to look to Paul, whose clear articulation of the gospel provides the key not only to Mark but to testing all the rest of scripture. Luther was not the first to assert the authority of scripture — not by a long shot. But he drew an unprecedented conclusion from the traditional esteem for the Bible as Word of God that marked a new moment in Christian understandings of the Bible as God’s living Word. With the Christian tradition before him and much of it since, Luther affirmed that scripture contained the Word of God. But for Luther and others of his theological descendents, the written scriptures are important not just for what they contain but in addition — or even rather — for what they convey: the Word Incarnate, Jesus Christ, to be grasped in faith — God’s Word, as Paul writes to the Thessalonians, “which is also at work in you believers.” Through his choice of biblical figures, their arrangement, and especially the dialectical positioning of the entire Bible and the opening verse of John’s Gospel, Dürer renders Luther’s discerning insight about God’s living Word and where it is found into powerful visual idiom. Albrecht Dürer: The Four Apostles, 1526. Barbara Pitkin, Ph.D., Senior Lecturer in Religious Studies at Stanford University and the author of What Pure Eyes Could See: Calvin's Doctrine of Faith in Its Exegetical Context (1999). She is a member of Grace Lutheran Church in Palo Alto, California. This article was first published by www.journeywithjesus.net in October 2011. For more materials for the Christian calendar, click here.